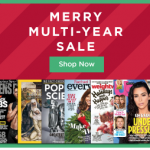 For a limited time, Discount Mags is running a Digital Magazine Subscriptions Sale! Remember you can gift magazines to your friends or get these as a new subscription or renewal for yourself!Have something else in mind? Use coupon code COUPONINGFOR4 to get 20% off of almost anything … [Read more...] about Digital Magazine Subscriptions Sale! This weekend Discount Mags is having a Multi-Year magazine subscription sale where you can save more on longer subscriptions! Remember you can gift magazines to your friends or get these as a new subscription or renewal for yourself!Have something else in mind? Use coupon code COUPONINGFOR4 to … [Read more...] about Multi-Year Magazine Subscription Sale!